BS EN ISO 14122-3:2016 Safety of Machinery - Permanent means of access to machinery - Part 3: Stairs, Stepladders and guard-rails. 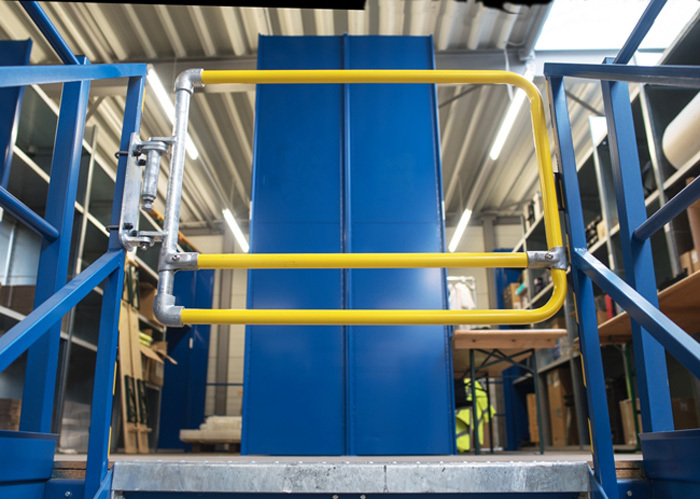 The new Kee Gate range retains the key elements of the existing safety gates, but has been modified to meet the BSI Standard. Released in 2016, the revised standard defines the requirements for safe access to machines. It applies to both stationary and mobile machinery where a fixed means of access is necessary. The standard specifies that when the height of a fall could exceed 500mm, a guardrail should be installed, and the chosen system needs to meet several dimensional requirements. It also notes that a self-closing gate should be used. As well as being compliant to BS EN ISO 14122-3:2016, Kee Gate also complies with the requirements of EN 13374 Class A, and is CE marked to EN 1090. The system has undergone extensive testing to ensure total reliability of the gates. These include salt spray testing to ASTM B117-11 Neutral solutions over 200 hours to assess the coating's corrosion resistance, life cycle testing to BS 6375-2:2009 Clause 6.5 - Opening and closing of Gate through 90 degrees 50,000 cycles and Abuse Testing where 9 x 25kg weights were suspended from the gate to test what happens if pressure is applied. This ensures durability, superior corrosion resistance and defence against signs of wear.